"A combination of cool and crunchy vegetables with a zap of crushed red pepper and other seasonings." 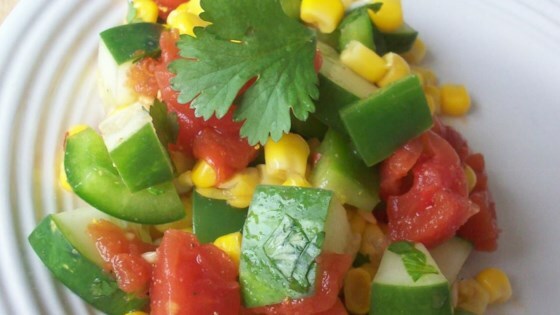 In a large bowl, toss together the cucumber, corn, tomatoes, green bell pepper, red bell pepper, and red wine vinegar. Season with crushed red pepper flakes, garlic, cumin, cilantro, salt, and black pepper. Cover, and chill at least 30 minutes before serving. Very good salad. I followed AMHONG's tweakings from below and firmly concur with her suggestion to use fresh cilantro. Dried cilantro is awful and doesn't improve any dish it is put in. The only changes I made were to use fresh halved grape tomatoes, and fresh cilantro. It was way too spicy for me but Husband really liked it. He said it was tasty and refreshing! This smelled wonderful! Next time, I would double the amount of cucumber. Very easy to prepare and it looked good also. I used fresh tomatoes instead of stewed ones. Will make again. We loved this salad! I used Mexican style stewed tomatoes, fresh cilantro, and 1/2 the red pepper flakes. This was very tasty with our basil burgers.Thanks Ecuadorita!